What It’s About: In order to borrow money from Mrs. Teasdale (Margaret Dumont), the bankrupt state of Freedonia makes Rufus T. Firefly (Groucho Marx) its president. Neighboring Sylvania sends inept spies Pinky (Harpo Marx) and Chicolini (Chico Marx) in to Freedonia; chaos ensues. Why watch it today? : Harpo Marx was born on this date in 1888. 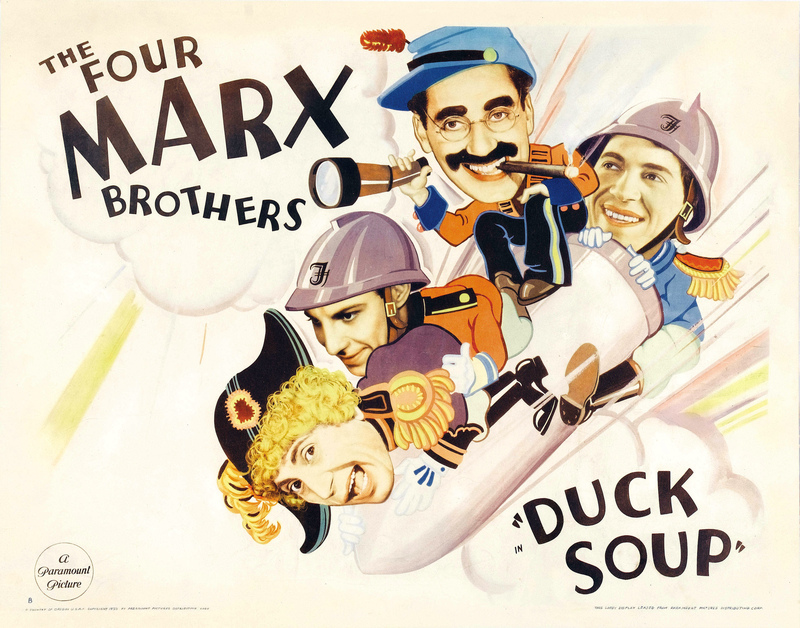 Duck Soup features the Marx Brothers at their most irreverent, and was their last film with Paramount before switching to MGM, where studio interference (and the departure of Zeppo Marx from the team) lead to films with more conventional plots and non-Marx Brother leads to act as love interests. This entry was posted in Comedy, Movie of the Day, Slapstick and tagged Bullshitania, Charles Middleton, Chico Marx, Groucho Marx, Harpo Marx, Herman J. Mankiewicz, Leo McCarey, Margaret Dumont, National Film Registry, Paramount Pictures, spy, The Marx Brothers, Zeppo Marx.